Last night's 15-13 extra innings Braves win over the Phillies game was weird. For one, it's the second-most runs ever allowed in a game started by Roy Halladay. (The record is 17, per commenter below.) 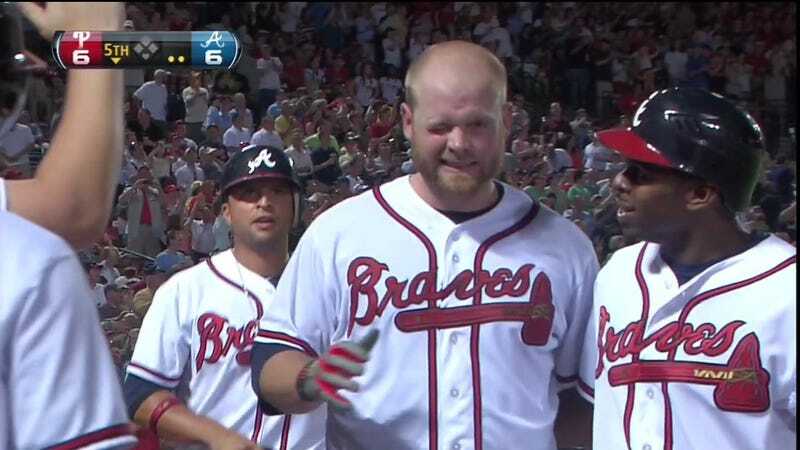 Halladay also gave up a grand slam to Atlanta's Brian McCann, the first such homer since Evan Longoria launched one in 2008. The weirdest thing, though, is what happened after McCann's slam. If you watch closely in the above video, you'll see a bit of a hit-and-miss between McCann and Michael Bourn—a lack of hand-eye coordination that resulted in Bourn's hand coordinating with McCann's eye.